qTest Manager seamlessly integrates with Jira, Agile ALMs, automation frameworks and continuous integration tools. qTest Manager provides Jira users with a robust and easy-to-use test management solution that integrates in real-time. Learn more. Send your JUnit test results directly to qTest Manager for reporting. 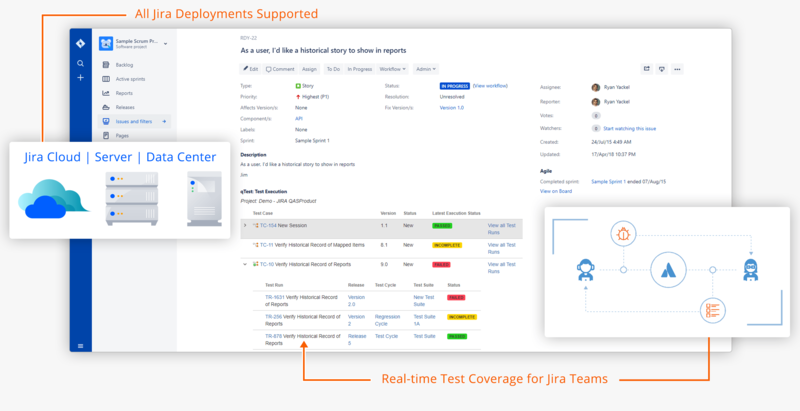 qTest Manager’s real-time integration with Jira provides test coverage for issues and automatic bug submission. Integrate with commercial and open source automation tools, or build your own integration through the qTest APIs. Quality Center Not Working with Jira? You Aren't Alone. Don't settle for HP Quality Center's complex mapping and scheduled data synchronizations with Jira. Make the switch to a real-time solution. Easy ramp up and intuitive user interface makes it easy to get started with qTest. Robust real-time integration with Jira – no constant syncing required. Hundreds of Enterprises have made the switch to qTest — try it free and see the benefits. When you integrate our platform with Jira, VersionOne or Rally, you'll get a complete solution that lets you manage requirements, defects and test coverage across multiple systems simultaneously. Test against Rally user stories and submit defects. In a recent survey, 87% of paid qTest customers that have integrated Jira, Rally, VersionOne and other tools said that qTest has improved their workflows.